Should Businesses Relocate to Downtown Kingston? One of the big buzzes in Jamaica, these days, is the restoration of Downtown Kingston. Well, Downtown Kingston (Downtown) has been undergoing transformation for over the past 30 years, for the better. It has happened in phases, but the sustainability of these efforts, have been curtailed by ineffective governance, where security and neighbouring community incidences are concerned. It's just that most Jamaican governments have not been visionary and effective enough at implementing plans for this Caribbean jewel. Anyway, in the latest PR efforts of this present government, we once again hear that Downtown is to be restored. Digicel, the Caribbean's largest mobile provider, is building their global headquarters, Downtown, which will house all their Jamaican workers and then some. Other businesses, encouraged by the news, are following suit. Information Minister, Daryl Vaz, yesterday, said that land prices, Downtown, will increase by 20% as a result of the resurgence of Downtown Kingston. There is even a new Transportation Centre, to prepare for the resurgence of businesses there. [Well, Downtown Kingston has always been a major terminus for a lot of bus routes]. On Wednesday, Downtown had it's "Christmas in the City" - akin to Uptown's "Fashion Night Out", an evening of super-sales from 5:00 p.m. - 12:00 a.m. Things went well, street vendors and businesses Downtown, did brisk business, as prices were slashed up to 50%. Thousands of consumers went Downtown to capitalize on the bargains there. There was a heavy police presence and certain streets were blocked off, to ensure the security of shoppers. But amidst the hoopla, there is still an outstanding question: should businesses relocate to Downtown Kingston (Downtown)? I will attempt to answer this question, based on what I know and have experienced whilst working Downtown, over ten (10) years ago and what I have gathered from people who still work there. 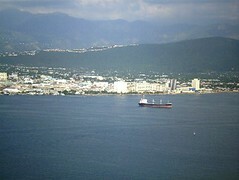 The view, oh my goodness, the view of the Kingston Harbour (the world's 3rd largest harbour), is absolutely breathtaking! [The building in which I worked, was strategically located near to Kingston Harbour, so that you could view the Harbour, the ships and barges and see the planes taking off and landing at the nearby Norman Manley International Airport, from your office window... this was simply majestic! ...This view helped ease some stressful days. :) ]. 1) You can walk to nearby restaurants, stores and arcades (where you can get dry goods, cheap), as these facilities are within blocks from major businesses there. (Jamaican blocks are much shorter in distance, than those in the USA). (Picture of a street in Downtown Kingston by BBC World Service). 2) There are lots of markets [official and unofficial (street vending)] where you can get goods and fresh produce cheap! (More vendors are now being moved into official vending areas, however). 3) The prices Downtown are much better than those Uptown, with as much as 30% less for goods of comparable quality to those Uptown. 4) There is a quietness re Downtown, that's absolutely enjoyable...you don't hear much honking of horns and drivers are a little more cautious, because most roads are too narrow for them to carry on with the shenanigans they do, on and above Half-Way-Tree Road. 1) Too few, legal parking spaces...so if your your company is relocating, you should arrange with the Urban Development Corporation (UDC) or other businesses that own parking lots, to use their parking areas. a) You should wear no jewelry...or else your hand, finger or wrist, will go with it. b) It's not the place to be after 5:30 p.m., so most people, if they take the bus, are rushing out of there by 4:45 p.m.
i) Expose your money...you will lose it. Ways of protecting your hard-earned money include (for ladies) wearing short-strapped handbags that you can keep safely to your person and (for men) not carrying wallets that bulge. iv) Ask for directions from pedestrians - it will expose that you don't know where you're going and you'll be a target. 3a) You need to ensure that you know where you're going and how to reach your destination, before you get there. When given instructions, use your map, beforehand, to ensure that you know how to reach your destination, safely. For some places, it's better to drive/(be driven) there, than to walk. 3b) Only ask for instructions, when absolutely necessary - ask the police, people who work in stores, or people who look like professionals, and don't make it obvious that you're doing this. 4) If the surrounding communities are at war...you may have a problem venturing to and from work safely. If there are gunshots or news of impending war, in neighbouring communities, get out of there by 3:00 p.m., or else you'll be trapped in a war. These were the realities (good and bad), that employees of businesses, Downtown, faced, over ten (10) years ago and still face today. Nowadays, there is an increased police presence, Downtown, which is good. The Jamaica Constabulary Force (the Jamaican police) say they will beef up security, as more businesses re-venture, Downtown. If employees safeguard their personal security, then they can work and traverse, the highly-trafficked areas of Downtown, Kingston, in relative safety. However, until all the above security issues and neighbourhood wars, are addressed in Jamaica's security plans, your business should relocate Downtown, with caution. Yes, land prices may be dirt cheap and you may even be thinking of restoring an old building there, for your new location, but the safety of your business and employees are paramount. Please join your local, private sector grouping (e.g. the PSOJ, SBAJ) and speak with business owners (who've owned businesses Downtown, for many years), who are members and learn how they protect their businesses and employees. Listen to their advice, keenly! What they may not tell you is that many pay extortion money, so that their businesses are not looted, or burned down. Digicel doesn't have to pay extortion money, due to their size (revenues, profits and them employing just over a thousand Jamaicans). Hence they are able to complain to the governmnet and get effective action when needed, as a result. Smaller businesses do not have this luxury. So until you've done your due diligence, please relocate to Downtown, Kingston, with caution. 1) Mar-Law, for the use of her inset photo of Kingston Harbour, with Downtown Kingston in the background (the buildings in white). 2) BBC World Service for the use of their photo, entitled, "Downtown Kingston"). Hurricane Tomas which ravaged Barbados, St. Lucia and St. Vincent and the Grenadines as a category 2 hurricane on Saturday, was downgraded to a Tropical Storm on Monday, further downgraded to a Tropical Depression on Wednesday and then upgraded to a Tropical Storm, yesterday. It has remained so until this moment. As it's outer bands near the Eastern end of the Jamaica, the island is currently under a tropical storm warning. This means that tropical storm conditions will exist within the next 24-36 hours. At 10:00 a.m. this morning, the centre of Tropical Storm Tomas was located at latitude 16.3 degrees North and longitude 76.1 degrees West, or 105 miles, South of Morant Point Jamaica, the most easterly point on the island. Maximum sustained winds are 50 miles per hour (mph) and it is moving towards the North at 8 mph. Tropical winds extend 85 miles from the centre and Tomas will pass 35 miles from the Eastern end of Jamaica, later today. Tomas is expected to continue North East then turn towards Haiti, tonight. Rainfall has started to affect the Southern and Eastern ends of the island, whilst strong winds of 35 mph have started to affect Morant Point, Jamaica. The Ministry of Education and the Office of Disaster Preparedness and Emergency Management (ODPEM) has ordered all schools in the Eastern parishes of St. Thomas, Portland, and St. Mary and the South Eastern parishes of St.Catherine, Kingston and St. Andrew, closed today. Businesses were also encouraged to send home all non-essential staff by mid-day today...so that they could be out of harms way in journeying home. For hourly updates re Tropical Depression Tomas, please listen to Radio Jamaica, Power 106 FM, Nationwide Radio and visit website: www.Stormpulse.com. 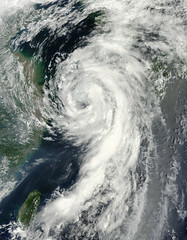 (I would like to thank NASA Goddard Photo and Videofor the use of their Flickr inset photo of tropical storm Dainmu which is similar in shape and intensity to what Tropical Storm Tomas would look like, by satellite). Accessories That Will Make Your Chevy Tahoe, Red Hot! Chevy Tahoe SUVs are in a class by themselves. I mean you see someone in a Chevy Tahoe and they're completely different people - it's like they feel obligated to dress and to act in a way that demonstrates apt ownership of these SUVs! Chevy Tahoes are luxury, road-worthy vehicles, that are used for everything from normal, round-the-town driving to heavy-duty driving like dragging horse floats (used to transport horses) or for handling rough terrain. You can, however, make a used Chevy Tahoe, brand new, by using the right luxury accessories. You can also preserve the life of your new Chevy Tahoe, with certain accessories. These Chevy Tahoe accessories are custom-made for your Chevy Tahoe and include luxury billet grills, bug and stone deflectors, spoilers, wheels and rims, chrome accessories and trim,interior upgrades, lambo doors, license plates and frames. For just a few thousand dollars extra, you can get up to twice the buying price of your Chevy Tahoe SUV. 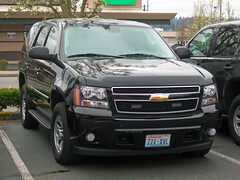 [Provided that your Chevy Tahoe is less than five (5) years old,however]. ...Which makes your investment in these accessories, well worth your while. Additionally, certain accessories like luxury interior upgrades, make driving in your Chevy Tahoe, super-comfortable - especially on long, cross-country drives. Other accessories like liquid clutch, gas and brake pedals come with anti-skid surfaces that make driving, easier and safer. Chrome accessories give a luxury finish to your Chevy Tahoe's exterior, whilst preserving its life, as these don't rust as easily as iron. ...and outfitting your Chevy Tahoe with Lambo doors, not only makes a fashion statement, but ensures that your Chevy Tahoe will become an attractive buy, for that rich car aficionado/collector who's bound to see it as a sweet collector's item. (The photo above is of a Chevy Camero with Lambo Doors that open up into the air, by Jorag85). These are just some Chevy Tahoe accessories that extend the life of your vehicle and allow you to recoup your investment within a few years. Accessories that you should seriously consider buying, so that your Chevy Tahoe will be an investment and not an expense, for you. 1. AJM STUDIOS for the use of their Flickr inset photo, entitled, "Lynnwood, Washington (AJM NWPD)"
2. Jorag85 for the use of his Flickr photo entitled, "Chevy Camero").